This an archive post, which I first published this time last year after running the Brighton Half Marathon. I’m participating again tomorrow to raise funds for the child bereavement charity Winston’s Wish. Please click here if you would like to make a donation. Thanks as always for all of the support. I ran the Brighton Half Marathon yesterday. It had been planned for ages and my wife, Desreen, was due to take part with me. I knew she wouldn’t need to get into any special training because she was already in such good shape and was regularly running six or seven miles to work in the mornings. Allow me to indulge for a moment because I so rarely do. Thanks to the regular exercise and a beauty regime that would put Naomi Campbell to shame, she looked the best she ever had in the months before her untimely death: slim but not skinny; great hair and skin; successful, fulfilled and happy, each making her more attractive than anything traditionally aesthetic could. I caught a glimpse of her at our son’s second birthday party last October and I remember thinking how lucky I was that the woman I’d married just kept getting more and more beautiful and focused with every year that went by. That she had more drive to be the best she could be since she’d had a child rather than less. Anyway, back to Brighton. Thousands of people filled the streets with numbers, trainers, sweat and Lucozade. The sun made a rare guest appearance and spectators and runners alike braved the February elements in shorts and t-shirts. Cheers, seagulls and the English Channel provided the soundtrack to the coastal run and I picked up a medal for the one hour, fifty-six minutes and fifty-three seconds of effort I put in. My colleagues, a friend and I raised thousands to help a charity to build homes and shelter for child-headed families living in extreme poverty in South Africa. I hadn’t even thought about it until now, but it feels pretty fitting and extremely poignant that I should raise funds for a charity for black kids who have lost their parents too soon. It was the perfect day for it and everyone did such a great job. Looking back at the day now, I thought I’d do a lot more thinking than I did as I ran, but I have a habit of emptying my head the moment my feet fill my trainers. I found that particularly odd given the location because Brighton, Desreen and I go way back. It was the scene of our first weekend away together almost eight years to the day earlier. It was where I chose a great restaurant right on the beach but a hotel far too far away from the action. It was where I got sunburn on a similarly unseasonal day eight years earlier. It was where she couldn’t get out of bed for the entire first day of our first weekend away together because she’d drunk way too much Champagne the night before. And it was where I found the perfect engagement ring in the perfect jewellery shop for the perfect girl five years later. None of these memories particularly played on my mind as I ran, though. I passed each of the landmarks that provided the backdrops to each of the souvenirs of our relationship, but somehow I didn’t feel plagued by them. I simply didn’t encounter the overwhelming sense of sadness that I had anticipated enough to carry a handkerchief while I ran. I just set out, thanked Desreen for the sunshine, kissed her wedding ring, which now sits next to mine on my left hand, and began to make my way towards finish line, which stood just over thirteen miles away. I ran with a pretty empty mind, a pocket full of wine gums and the knowledge that I would treat myself to my current favourite song on repeat from mile 11. Finding my feet at mile eight, I totally went for it, upped my pace and pegged it over the finish line within my target time. Then something strange happened. In fact I’ll correct myself. Nothing strange happened. I’d expected dramatic emotions. My imagination had seen me complete the final leg of the race in slow motion, the theme tune to Chariots of Fire playing, with Olympic-style tears streaming down my face as I collapsed in a heap and cried for the love of my late wife. Instead I got a medal, a bad case of cramp and a goody bag that contained a Mars bar and a bag of ready salted crisps, which I washed down with a sugary drink to relieve the pain. I sat on the pavement waiting for the physical pain to turn emotional, but it just didn’t happen. This got me thinking that emotions don’t always happen the way you expect, the way they do in the movies. In a film of my life, the crowds would have been cheering me over the line, applauding the courage of a newly widowed man being able to put one foot in front of another so soon after his wife died. A rising song would be playing, crooned by a power balladeer. The tears would have started streaming down my face at mile-twelve, others around me would have been so moved that the sea level on the coast would have risen from the added saline. I would have ripped off my shirt, kissed the initials tattooed on my chest and then been carried off on a stretcher as I recovered from the ache in my heart and my legs. Instead I just sat there throwing salt and sugar down my throat while I chatted to some guy who didn’t know me from Adam. And then I had quite a nice day drinking Guinness and coffee-flavoured stout with my work mates, talking about the run and making our way back to London on a predictably sluggish train. I walked through the door with a medal, a smile and a friend who had kindly picked me up from the station and immediately heard the most beautiful sound I now know. My son screaming my name, delighted to have me back. The film wouldn’t have shown the less dramatic, yet real, emotions that came and I wouldn’t have predicted that they were coming either. At 4a.m. I awoke with my child pretty much asleep on my head. The king size bed does nothing to prevent him wanting to invade my personal space. So I flipped sides to the left, which used to be occupied by my wife. And then the tears came. I thought about how she should have participated in the race with me. I thought about how there should be two medals hanging on the wall. I thought about how she would have been multitasking – running London Fashion Week and running the half marathon simultaneously. I thought about how I should have been hugging her at the finish line rather than chatting to a stranger on a pavement while my calves stopped cramping. And I couldn’t help but think about how much my son was going to miss out on the mum who had missed out not only on the run but on seeing her beloved child grow up. It’s not how it would have been in the movies, but then neither is grief. The real version would simply be too hard for anyone to watch. Ben,as you felt the energy of the sun as you ran,you will continue to feel the energy of Desreen in your being…grief imparts on us a scar that heals but always stays sensitive,love imparts on us an eternal link to the energy of those that have crossed over. Another blog that so many people will relate to. I think it is amazing you were able to not only do a half marathon but do it in the time you did. I found that for months grief zapped my energy and also my ability to focus on anything for more than a few minutes. On New Years day I began running again. My dear brother who died last September was a keen runner and had been texting me running tips on the day he died. To start running again was mentally hard but I find it so helpful.Just me and my music and my thoughts. There have been times I have found myself in tears as I run and times I have felt happy ( something that is happening more often these days ). Running is something I do for me and I need that me time as much as I need time with family and friends. Wow!!! Just wow! Although, all the love in the world could not replace your heart’s desire, nevertheless still wish you and your boy. 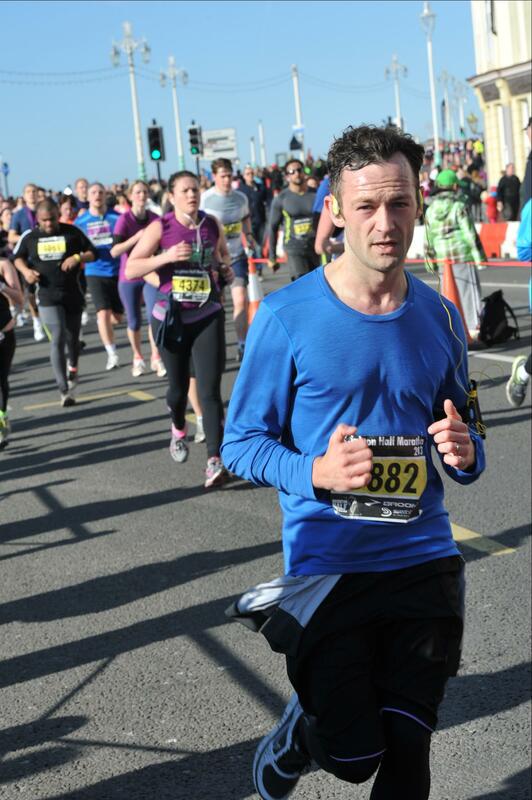 This entry was posted on February 18, 2013 by Ben Brooks-Dutton and tagged Brighton, Brighton half marathon, Bruno Mars, children, crisps, Desreen Brooks, engagement ring, English Channel, friends, grief, Guinness, life as a widower, lifeasawidower, male grief, marriage, Mars, memories, October, sugar, tears, toddler grief, wedding ring, weekend away, widow, widower.